Persuade (someone) to take action. Building confidence in the validity of an idea. Inspiring action. The sellers who do these best sell the most. While a few do insight selling naturally, many struggle. Sellers might know with great certainty that when buyers buy they’ll be better off as a result, but they just can’t get the buyers to believe it too. What’s interesting, though, is that the sellers who are good at selling an idea and those who aren’t often both understand the idea and its importance. It’s just that some communicate it far better than others. Those that do insight selling well—whether they know it or not—satisfy the same basic criteria every time, following the same story format. And the great thing is this: the basic structure is simple and learnable. 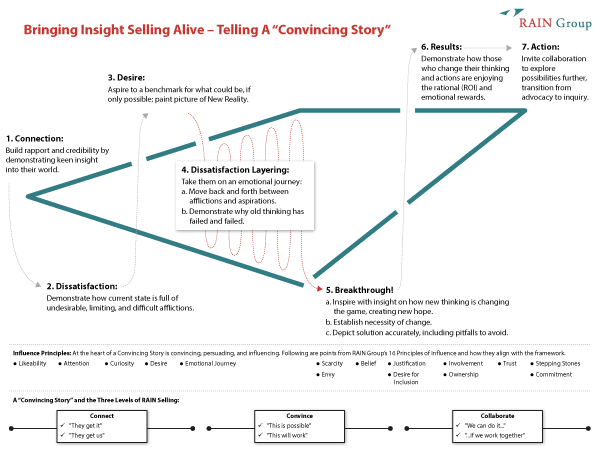 We call this basic structure a Convincing Story and we outline it in detail in our new book, Insight Selling: Surprising Research on What Sales Winners Do Differently. What do I want them to learn? Follow the format, and you’ll get the response you seek. Connection – Establish Credibility: Build rapport and establish credibility by demonstrating keen insight into their world. This can be an overview of industry trends that are influencing everything, technology changes that change the game, or an overview of any context that is relevant to them and gets them saying, "They get it" or "They get us." Once you establish yourself as knowing what you’re talking about, you’ll get their attention and build curiosity in hearing the rest of what you have to say. Note, however, that you are not the hero of the story. They are. You establish yourself by establishing your relevance to them. Dissatisfaction – Name the Adversary: Next, establish the current state and why it’s not good enough. The heart of every action and change—and a key component of insight selling—is the desire to be in a different, new place. By establishing the current state and why it’s not good enough, you give the adversary a name. You put a target on its back. The adversary can be almost any set of afflictions: lack of results, slipping market share, wasted time on workarounds, ideas whose time has passed…anything. The masters at insight selling don’t just tell people what to run towards, they give people something to run away from. Desire – Establish the Destination: Imagine if… Imagine a world where… Imagine... People have a natural tendency to drive forward. But if they don’t know where they’re headed, any road will get them there. Your ability to establish the destination—to help them imagine some specific aspiration—is critical. Average sellers focus on establishing the path: “This is what we do and the way we do it.” These are how messages. Nobody cares about the how until they feel the depths of the why. Getting to a New Reality is the why. Why is a powerful force. Dissatisfaction Layering – Journey to the Pit of Despair: Simply suggesting, “Here’s where we are and it isn’t good enough,” isn’t, well, good enough. It’s too antiseptic. It doesn’t create the intense feeling of desire that’s so important for change, and so critical for insight selling success. One of the most powerful ways to do this is to describe approaches that haven’t worked and why. By doing this, you can go back and forth between the current state and the possible New Reality, and you bring the audience along for the ride. A Convincing Story is an emotional journey, and it’s a bit of a roller coaster. Establishing dissatisfaction and desire shouldn’t be linear. It’s back and forth. The net effect is that the audience feels the undesirability of the current state more powerfully by being reminded that others have been trapped here, tried to get out, and couldn’t. Since everyone relates stories to themselves, they’ll feel trapped as well. They’ll feel the failure of others. They may just see some things they, themselves, tried that didn’t work. At the same time, you’ll remind them of the possible New Reality that seems out of their reach. Do this and you’ll build their desire to achieve the New Reality that much more forcefully. By going back and forth between the current state and the possible New Reality, you not only establish a very important rational gap (you’re here, but you could be there), you also maximize the negative feelings associated with being in the bad place and stoke the desire to get to the good place. Breakthrough! – Introduce a New Hope: Just when the buyer feels resigned to a life in the Pit of Despair—where many (like them) are stuck—you show them a different path. A path others they do not know about have taken to successfully climb out of the pit. A new hope! When they see what others have achieved when they made a chance, they’ll want to achieve the same. The concept is envy. Not only does this establish you as scarce and differentiated solution, but also as a straight shooter who’s on their side. Do so and they’ll start to believe you, and trust you and the solution that much more. Some sellers get this far, but miss this step. When that happens, the buyer “sees” the solution and they understand that the return on investment case is compelling, but they still doubt they can achieve it. Sometimes they think they can achieve it without you. An outcome of insight selling is to help them see that your knowledge, your collaboration, and your partnership in the journey is essential for their success. Results – Communicate Results, Create the Feelings: Many sellers know how to tell a return on investment story, but few do everything they should to communicate the full power of the impact. You still need to tell the ROI story—and you probably did so in general terms when you established the possible New Reality—but now you must make it real by showing real, specific results. The better you can show real results, the more confidence you’ll build that the buyer can achieve them, too. At the same time, you complete the emotional journey because they’ll imagine themselves having achieved those same things. Once they do this, they’ll want to be in the “in” crowd who have been successful here. Their desire for inclusion will intensify. Now they’ve been to the lows (dissatisfaction layering, seeing and feeling the gap), and they feel the highs. As much as some will argue to the contrary, business buyers buy with their hearts and justify with their heads. Selling an idea isn’t just about numbers. Use the Convincing Story structure and you’ll give buyers the justification case for themselves and for others, and make them want the results all the more. Action – Invite Collaboration: Every seller has been told to recommend action, specifically a next step. Few, however, build in collaboration. When buyers feel like sellers collaborate with them, they are much more likely to buy, and to buy from that particular seller. At this point, your call to action will be to invite discussion and collaboration. Many sellers try to move too quickly to make a sale. Jumping from here to a sale is a big leap. By asking only for a commitment to collaborate, you shorten that leap with a stepping stone that moves you closer to the sale, and increases its likelihood of happening. Collaboration is very powerful and is a core component of insight selling and a Convincing Story. Collaboration involves the buyer in the story itself. When people are involved in something, they become invested in its success. The more they become invested in something, the more they take ownership of seeing it through. But, perhaps most powerfully, collaboration creates shared experience. Shared experience leads to intimacy in the “I know you really well” sense. Intimacy is a pillar of trust. And trust is essential when building confidence and selling an idea. There you have it: the elements of a Convincing Story, an essential component to bringing insight selling alive. Use the Convincing Story structure and you’ll achieve the three outcomes you need to sell an idea: learn, feel, do. Current state is not good enough. It needs to change. You “get it” and “get them” because, without even talking with them much and like reading their minds, you’ve described what their world is like. Possible New Reality is much more desirable. The stakes are high if you can win this game. The rational impact (the ROI) is clear. There’s a path to get there, but it requires different thinking and action. But do it right and results are achievable. The depth of how undesirable their current state is. Its frustrations, problems, and difficulties. The full desirability of the possible New Reality and everything that comes with it (e.g., money, success, attention, relief, happiness), even envy of those who have what they don’t. Confidence that you, your offering, and your company can help them get the results. Confidence that the result is achievable and, at the same time, worth the risk. Do: Collaborate with you to bring the New Reality to life.